I arrived as a first-year grad student at MIT in September, 1973, fresh from a one-year independent research project developing an idea for Computer-Aided Musical Interpretation. With working hardware at hand, I was eager to explore the viability of a patent and signed up for Bob Rines's Inventions and Patents course that fall, and the continuation of that course the following spring. Little did I know in 1973 the adventure I was about to undertake, an experience that was to last over 20 years. I could not help but be drawn to the magic of Bob's teaching, insight, and intellect, and can say without hesitation that he influenced me more that anyone else I encountered during my years at MIT. Not many classes had been held that fall before I told Bob what I had been developing. I fully expected him to point me to some references in the library describing the methods by which one might obtain a patent, something I thought too mundane to be presented during his course. Instead, he immediately wanted to see what I had done and, following a demonstration at my apartment in Watertown, offered to mentor me in writing my own patent application. I was not unusual in this regard. Several other students taking the course also had inventions they wished to patent, and he gave them equal amounts encouragement and help. The patent application I prepared that fall, with editing changes made by Bob, was submitted to the US Patent Office the following summer, and issued finally, after an ordeal of rejections, in May of 1977 (Patent 4,022,097). I surely would have given up following the numerous nonsensical rejections by the patent office were it not for Bob's continuous encouragement and support. with them under Bob's tutelage resulted in our traveling to Japan together and securing a license agreement with Casio. In the years that followed, several other individuals developed this method independently during the 17 year life of the patent, and one additional license was granted to an American college professor, independently wealthy, who invested a great deal of money in developing hardware and software, but failed for lack of marketing expertise (he attempted selling his software to primary schools under the name "Instant Pleasure"!). During the spring semester of Bob's course, he invited a number of innovators from companies in the Boston area to speak to the class about their experiences, their companies, and the difficulties they encountered in protecting their intellectual property. Bob asked that I record these classes so that others not in attendence could hear them, as well as his students at the just-founded Franklin Pierce Law Center. 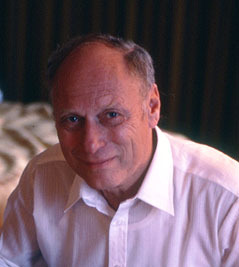 I recorded about eight classes for Bob's use which included some sessions in which he alone lectured. Four have survived to the present day and are presented below as a fascinating glimpse into Bob's teaching and the many aspects of protecting intellectual property. 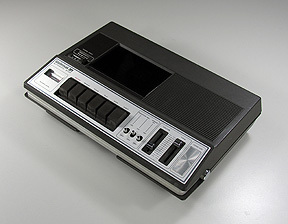 This Wollansak Model 4350 portable cassette recorder (circa 1973) made the recordings you hear below and was used in playback of the original cassettes during the summer of 2010 to digitize the recordings. Bob's classes at that time were held in the MacGregor house dining hall at MIT and ran from about 7 to 9 pm once per week. He permitted me to place the recorder on a table directly in front of him making possible the excellent sound quality in these recordings. Recognition must be given also to this Japanese-made recorder for working almost as well now as it did when I purchased it 38 years ago. I dare say that the tapes, and this machine, may well survive the digital format into which these recordings have been transcribed, let alone the equipment used to do so. 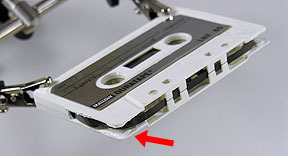 Although the polyester tape and magnetic surface have aged little through the years, the adhesive holding the leader to the recording tape disintegrated. This resulted in these pieces of tape separating when I rewound the cassette, causing each to disappear inside the permanently sealed cassette, rendering it unplayable. After a few distressing moments, I decided to use a Dremel Moto-Tool with a tiny saw blade to cut away the left and right walls of the cassette just enough so that I could reach inside with a tweezers to grab the tape ends and splice them back together. He describes the latest camera platform and the imaging difficulties they have had with silt and particulate matter in the water. He also describes recently processed photos showing a flipper and the entire body outline of a large animal. He discusses the patent bar, attorneys without technical training being marginally competent, and then entertains a student question about judges and the income of judges and attorneys. He discusses the Kiwanis case and the impending Supreme Court decision that may forbid trade secrets. He continues his discussion of the Kiwanis case. Presentation by Francis W. Davis, the inventor of power steering. Presentation by Sam Neblow, one of the founders of Energy Sciences Corp.